At its annual E3 press conference today, Sony Interactive Entertainment America LLC (SIEA) debuted a line-up of premier content for PlayStation®4 (PS4™), including Days Gone (SIE Bend Studio), Spider-Man (Insomniac Games), LEGO® Star Wars™: The Force Awakens™ (TT Games and Warner Bros Interactive Entertainment), God of War (SIE Santa Monica Studio), DEATH STRANDING (Kojima Productions), FINAL FANTASY® XV (Square Enix), RESIDENT EVIL® 7 biohazard (Capcom Co.), and many more. SIEA also announced the North American launch date of October for PlayStation®VR (PS VR), a virtual reality system that takes PS4 to the next level of immersion. Along with the launch date announcement, SIEA unveiled a breadth of unique PS VR experiences, including Farpoint (Impulse Gear), Star Wars™ Battlefront™: X-Wing VR Mission (Electronic Arts), and Batman™: Arkham VR (RockSteady and Warner Bros Interactive Entertainment). PS4 continues to remain the fastest-selling console in PlayStation ® history with more than 40 million units sold worldwide, and new game announcements revealed on stage at the Shrine Auditorium in Los Angeles demonstrated how PS4’s library will further expand with an unparalleled line-up of games. SIE’s Worldwide Studios (SIE WWS) unveiled three new ambitious games during the show – God of War, Spider-Man and Days Gone. Developed by Santa Monica Studio, God of War opened the show with a reveal showcasing a refreshed gameplay experience that continues the next chapter for iconic character, Kratos. As part of the reveal, renowned musical artist Bear McCreary, composer for God of War, shared his score for the game while conducting an incredible live orchestra. The debut of Spider-Man for PS4 introduced players for the first time to an authentic new Spider-Man story and universe being developed through a close collaboration between Insomniac Games, Marvel and San Mateo Studio. Additionally, Days Gone marks the long-awaited return of Bend Studio, who debuted a trailer highlighting a story about loss and regret set in a stunningly realistic high-desert of the Pacific Northwest, and closed the press conference with a live demonstration of emergent, open-world gameplay. Other featured titles from SIE WWS included highly-anticipated titles Horizon Zero Dawn, Detroit : Become Human, and The Last Guardian. SIEA also announced that The Last Guardian will launch on October 25, 2016. Also, in partnership with SIE, celebrated game creator Hideo Kojima took to the stage to announce his new PS4 exclusive title, DEATH STRANDING. DEATH STRANDING will be produced, written, directed and designed by Hideo Kojima himself, and will star actor Norman Reedus. In addition to the wealth of content coming from SIE’s WWS, partnerships with the industry’s leading developers and publishers will further solidify PS4 as the best place to play for gamers. At the press conference, SIEA announced it has worked with Activision to bring back one of PlayStation’s fan favorite characters, Crash Bandicoot. Coming to PS4 first this October, Crash appears in Skylanders® Imaginators, the latest game from one of the most beloved franchises. Additionally, in 2017, fans can play Crash 1, Crash 2, and Crash Warped, fully remastered for PS4 by Activision and Vicarious Visions. SIE will also continue its partnership with Activision on Call of Duty®: Infinite Warfare, ensuring once again that PlayStation is home to one of the world’s biggest franchises. PlayStation 4 gamers will be the first to play all downloadable map packs from Infinite Warfare, and those who pre-purchase select editions of the game for PS4 will be the first to play Call of Duty: Modern Warfare Remastered’s campaign 30 days prior to launch on November 4. Additional featured partner titles shown during the conference include LEGO Star Wars: The Force Awakens, RESIDENT EVIL 7 biohazard, and FINAL FANTASY XV. PS4 owners will be the first to play the demo for the highly-anticipated LEGO Star Wars: The Force Awakens, and the demo for RESIDENT EVIL 7 biohazard will be made available first to PlayStation®Plus members. Additionally, it was announced that RESIDENT EVIL 7 biohazard will be fully compatible with PS VR. When PS VR launches on October 13, 2016 in North America, it brings with it the opportunity for virtual reality to reach the mainstream, as all 40 million PS4s in gamers’ homes are PS VR-capable. From some of the biggest franchises in gaming to brand new titles created exclusively for PS VR, a wide breadth of unique experiences will await gamers when PS VR launches. During the conference, SIEA unveiled new PS VR experiences, including Farpoint, Star Wars Battlefront: X-Wing VR Mission, and Batman: Arkham VR. From developer Impulse Gear and SIE’s San Mateo Studio comes Farpoint, an unnerving VR space adventure that will set a new standard for immersive VR. Batman: Arkham VR is from the critically-acclaimed Rocksteady Studios and is the first virtual reality Batman experience that will allow fans to experience Gotham City through the eyes of the World’s Greatest Detective in an all new Arkham mystery. Star Wars Battlefront: X-Wing VR Mission will immerse players in one of the most dreamt about Star Wars™ fantasies – piloting an X-wing in the far reaches of space. This all-new mission will be exclusive to PS VR this holiday, and is free*** for owners of Star Wars Battlefront. PlayStation VR titles will range from $9.99 to $59.99. Additionally, PlayStation Move controllers will be available as a two-pack bundle for $99.99 (MSRP). Pre-purchase Call of Duty: Infinite Warfare Digital Deluxe, Digital Legacy, Legacy, or Legacy Pro editions on PS4, and get access to the Modern Warfare Remastered campaign on 10-05-2016 on PS4. Offer available on PSN and at participating retailers only. 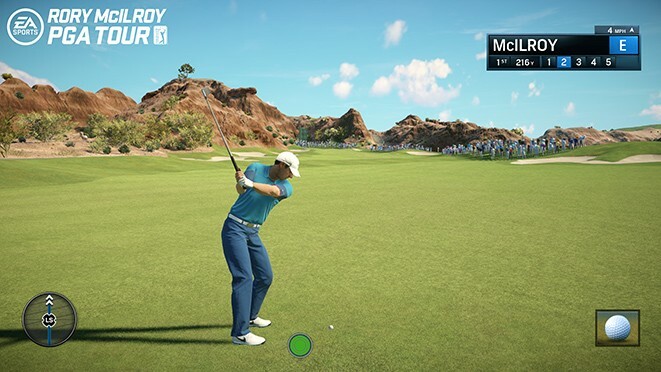 The petrol heads have been beaten by the golf lovers this week in the charts as Rory McIlroy PGA Tour has taken the number one spot. The only other new edition to the charts is God of War 3 remastered which is number nine. Train2Game news: God of War: Ascension game director hosting live stream at 4 P.M.
Train2Game students can get a first look at God of War: Ascension when Game Director Todd Papy hosts a live stream on The PlayStation Blog at 4p.m. The latest God of War title for PlayStation 3 is a prequel, which will introduce multiplayer to the series for the first time. “That’s right. God of War: Ascension will feature a ground-breaking new online multiplayer mode,” said Pappy. “We wouldn’t do multiplayer in God of War unless we knew we could do it right. That’s why I’m extremely excited to finally be able to talk publicly about it and share all the gory details with you live. I even have some exclusive gameplay footage to share with you, so be sure to tune in to see it all live.” he added. Train2Game students interested in game design are likely to want to tune into the live stream to find out how multiplayer is going to be implemented, and how the story for God of War: Ascension is taking shape. The stream is scheduled to start at 4 and can be seen here. What are your thoughts on the introduction of multiplayer for God of War: Ascension? What do you want to see from the game?